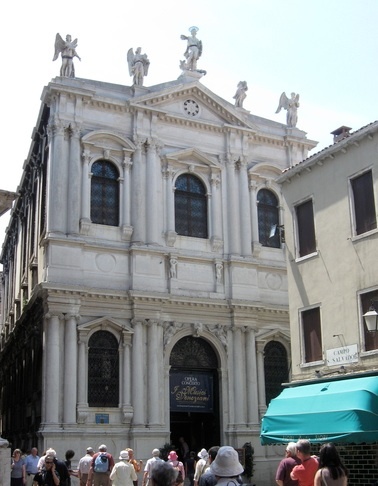 Before St Mark became the patron of Venice, St Theodore was the city's main celestial contact. His confraternity, which was in charge of an urn containing his relics, was founded in 1258 and linked to the Augustinian monks of San Salvador. The Scuola Grande itself was designed by Tommaso Contin and finished in 1613, with a façade by Antonio Sardi; a relief on the side of the building shows Theodore, dressed as a Roman soldier, standing on the back of possibly the least threatening looking dragon in Christendom. A monumental stair leads up to the Sala Capitolare designed by Baldassare Longhena, with its ceiling painting of the warrior St Theodore offering Venice as a gift to the Virgin Mary, and on the wall, an Annunciation by Palma il Giovane. The confraternity was reformed in 1960, and hires out the hall for exhibitions and concerts: I Musici Veneziani perform Vivaldi's Four Seasons and other Baroque highlights here in 18th-century costume and wigs several nights a week. Hours Concerts start at 8.30pm. Box office open 10am-7pm, or book on line.